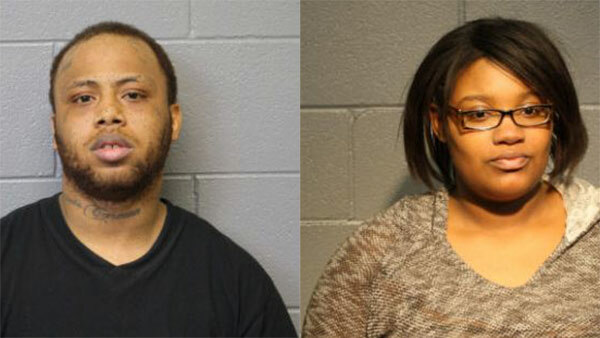 CHICAGO (WLS) -- Two people have been charged in connection with an armed robbery at a convenience store in the city's North Side, police said. Mitchell Thomas, 24, and Jamie Branch, 23, were arrested after being identified as two suspects involved with an armed robbery at a 7-Eleven store in the 500-block of North Halsted at 2:55 a.m. Friday, police said. Officers responding to the call say they observed suspects robbing the store, who then allegedly fled the scene in a vehicle that later crashed at Grand and Cortland. The suspects then allegedly fled on foot before two were caught. The armed robbery occurred within 27 minutes of two others in the area, although police are unsure if the incidents are related. Police believe two other offenders are still on the run. Anyone with information is encouraged to contact Chicago police at 312-747-8382.